The Zagreb airport Pleso, is situated 12 km from the city centre of Zagreb (see map below), the airport is the largest in Croatia, with international connection to most of Europe and domestic connection to the major cities in Croatia. Getting to and from Zagreb Airport: Pre-book private or shared transfer: the most hassle free form of transportation between the Zagreb Airport and the city centre is a pre-booked transfer. Price for a transfer of 1 to 3 persons is about 35 Euro, for a group of up to 8 persons price is around 50 Euro. Rent a Car: At the Zagreb airport you have option to rent a car from local as well as international car rental companies, offers for car rental at the Zagreb airport you can find here. Accommodation in Zagreb: The accommodation offer in Zagreb range from cheap hostel beds to 5 star hotels, if you have not yet found your accommodation in Zagreb you can find a large selection of hostel and bed and breakfast here, or here. 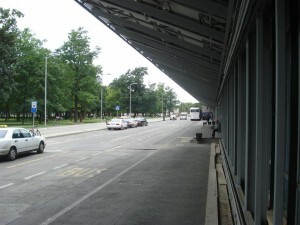 Airport bus Zagreb Airport: The airport bus is parked outside the main arrival terminal (You can’t miss it). The trip with the airport bus to the main bus station, takes about 30 minutes, at the main bus station, you have tram connection to the city centre and the train station. You can see departure times from Airport to city centre here PLEASE note that after 8 pm, you have buses leaving shortly after arrival of scheduled flights. If you are travelling from main bus station to the airport you can find the schedule here. Price for a one way ticket with the airport bus is 35 kuna.